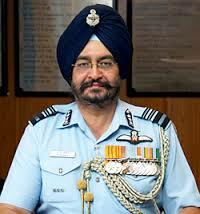 Air Marshal BS Dhanoa appointed as new Air Force chief. Air Marshal Birender Singh Dhanoa AVSM YSM VM took over as the Vice Chief of the Air Staff (VCAS) on 01 June 2015. He was commissioned in the IAF in June 1978 as a fighter pilot. He is an alumnus of Rashtriya Indian Military College, the National Defence Academy and the Defence Services Staff College, Wellington. Air Marshal Dhanoa is a Qualified Flying Instructor and has flown various types of fighter aircraft in his distinguished career. During the Kargil Operations, he commanded a fighter squadron and himself flew numerous night strike missions in the mountainous terrain.